Whose Kingdom Are Your Prayers Building? Around Easter time, I wrote a post briefly discussing the things that we can learn about Jesus during Holy Week. Today, I want to take time to specifically look at Jesus’ prayer in the Garden of Gethsemane and what we can learn from Jesus’ prayer to the Father to apply to our own prayer lives. As we discuss this, let’s keep in mind the situation that Jesus was in. Jesus had just shared The Last Supper with His disciples, and He knew that He was moments away from His betrayal, arrest, and eventual death. In sum, Jesus was in the worst of the worst circumstances as He prayed this prayer. Jesus prayed for Himself (John 17:1-5). Jesus prayed for His disciples (John 17:6-19). I believe that this is the 11 disciples that followed Jesus during His ministry on earth, and not all believers since there is a specific prayer for all believers in the verses that follow these. Jesus prayed for all believers (John 17:20-26). This prayer is for anyone who has or will accept Jesus as Savior. Jesus prayed for Himself (John 17:1-5)- We must read this knowing that Jesus is God, and that Him and the Father are One. Jesus’ entire prayer is about glorifying Himself for the sole purpose of glorifying the Father. Jesus also praises the Father by calling Him the One True God. Jesus prayed for the disciples (John 17:6-19)- Jesus spent so much time pouring into the lives of the disciples, and He tells the Father this. Jesus does not pray for them to be taken out of the world, but for them to be protected from the evil one who is in the world. Jesus knew His disciples must remain in the world to spread the Gospel to others (Matthew 28:19-20). Jesus also prayed for the disciples to have joy and for them to be sanctified by the Truth. The purpose of these things was also to glorify the Father. True joy comes from God and therefore brings Him glory, and sanctification is the process where Christians become more like Christ, which also brings Him glory. Jesus prayed for all believers (John 17:20-26)- This absolutely blows my mind that less than a day away from the cross, Jesus had all of those who would believe in Him on His mind. It is so humbling, and also so encouraging. In this part of the prayer, Jesus prays for the believers to be unified. Jesus also prayed for believers to remain in Him and the Father. Jesus lifts these prayers so that the world would know that the Father sent the Son for the sins of the world. Jesus also prays that His love would continue to be made known so that people would know that the Father sent the Son, and that others would know His love. So, what does Jesus’ prayer in the garden have to do with the way that we pray? Jesus lived a perfect life, and Him and the Father are one; therefore, we should use the way that Jesus prayed to model our prayers. Jesus’ entire prayer was all about glorifying the Father, and our prayers should be all about that same thing as well. 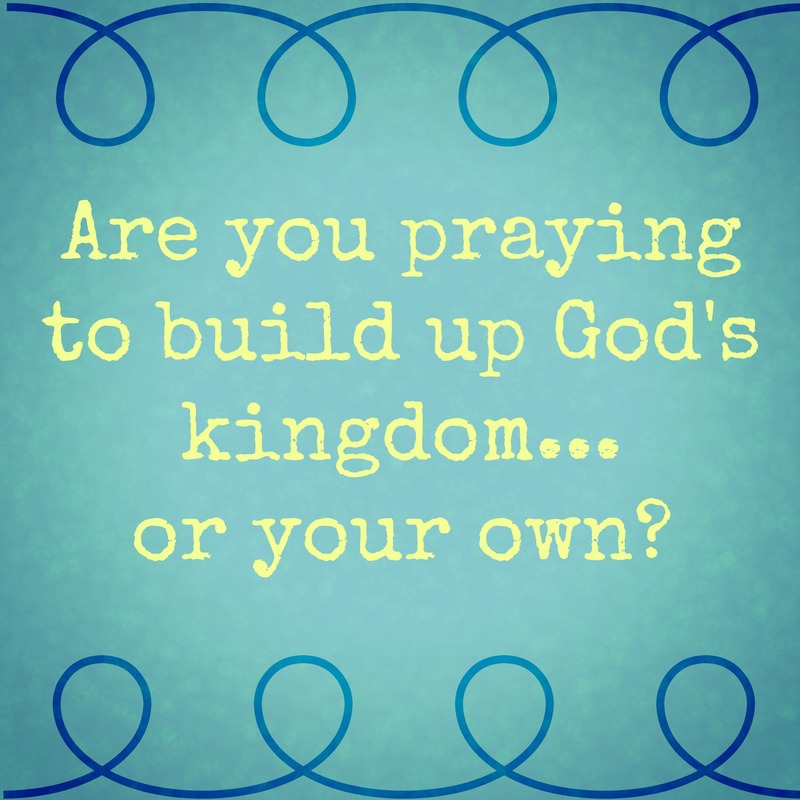 I remember a sermon that Jack, my husband, preached on prayer, and he challenged everyone with this question- Are you praying to build up God’s kingdom, or your own? Mom was sick with cancer when Jack shared this challenged, and to be honest, it rocked my world and completely changed the way that I prayed. I realized that I had been praying for Mom to be healed so that she could still be around and so that I could still have a mom. I was praying to build up my kingdom, not God’s. I had selfish intentions behind my prayers. Now, please hear me, there is nothing wrong with praying for healing. However, we need to ask ourselves why we are praying for healing. Once I realized my selfish intentions, I quickly changed my prayer to, “Lord, please heal my mom so that she can better serve You.” Obviously, the Lord knew that my mom had completed the work He had for her on earth, and He thought that it was more glorifying to Himself for her to be in heaven with Him, and that’s okay, because the Lord’s plans are always perfect. Jesus’ model for prayer, and the challenge to build up God’s kingdom, not our own, can be used in all of our prayers, not just prayers for healing. If you’re praying for a new job, you can pray that if it’s God’s will, you will get that new job to glorify Him. If you’re praying for a friend, pray that your friend would glorify Jesus in whatever situation they’re facing. If you’re praying for a financial situation, pray that God would use your finances to glorify Him. The list of examples could go on and on. God wants us to bring everything to Him in prayer- big and small- but bring it in prayer asking for His will and for Him to be glorified. When we do this, we are praying like Jesus did when He was facing one of the worst moments of His life. When we use our prayers to build up God’s kingdom, we are putting our complete trust in God, as we should. God will answer our prayers in His way and in His timing, both of which will be perfect. Like I’ve said a thousand times before, God’s plans are perfect, He knows best, and He is faithful. Pray to build up His kingdom and watch how He works things out for His glory and for your good. Don’t forget to pray prayers of praise as He works in your life and in the lives of others! Next postThe Struggles I Faced.